MAJR’s line of ready-to-install EMI/RFI honeycomb filters and Waveguides provide optimum EMI/RFI shielding with minimum pressure drop for the ventilating air. Shielded vent panel effectiveness is accomplished using waveguide honeycomb design principles. The choice of which honeycomb filter or waveguide will best meet your design considerations is based on three main criteria: shielding, air flow and mounting. 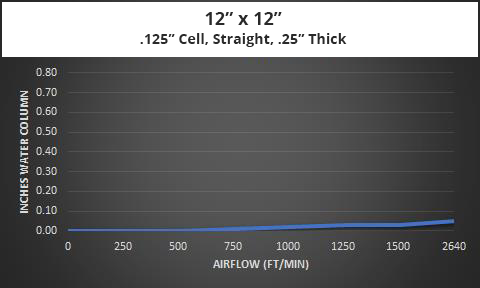 For most applications, aluminum code-32 honeycomb (properly installed using MAJR’s mounting frame with integral EMI/RFI gasket) will provide a degree of attenuation that will be within specification limits (see table 1). However, for the lower frequency range (H-field), it may be necessary to specify MAJR’s material tin plated steel code-44. MAJR’s engineering team can assist with applications requiring special mounting or shape. Installation of the honeycomb filter—with its 4:1 opening-to-depth ratio—provides the waveguide below cut-off effect required to attenuate EMI/RFI interference while not impeding the air flow required to cool the packaged enclosure. MAJR offers a wide variety of standard sizes, as seen below, which can reduce lead-time and setup charges for our customers. The data in Table 4 shows shielding characteristics for standard MAJR shielded vents. Note that the data indicated is based on a unit whose opening was 12.00 x 12.00 (305 x 305 mm) and tested under laboratory conditions per MIL-STD 285.